Scribing stories is an enjoyable activity to undertake at home with children and young people. If you start young enough they will continue to value you support as a scribe as they grow older. Siblings, grandparents and adult friends can all be Scribes. Scribing does not take long. Children enjoy Scribing becase they are in charge. You can start Scribing with children from around three, if not before. Very young children love to chatter and to tell stories. If you readto them or tell them stories they will quickly create their own based on what is around them, their toys; in fact, anything they encounter can become stuff for stories. My son would create epics with two lego bricks. If you write some of it down you show that you value their stories. When you read them back, you also help these pre-readers to associate the spoken and written word. You will soon find your pre-schooler wanting to read these special books for herself, especially if you decorate them with cut out pictures, photos etc. Writing is hard work. It is just as complex a task as reading if not more so. There are the mechanics of wielding the pencil or pen; the skill of forming the letters, sentence construction, spelling, and so on, even before consideration of the creative part, i.e. thinking of what to say and how to structure it. It is no wonder that for young children, writing is a slow, laborious and often stressful process. Often the creative pleasure of making a story is lost. 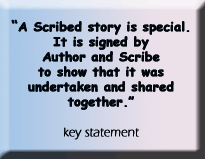 Scribing puts back the "creative" into creative writing. By acting as their Scribe you are sharing the work but also sharing the fun. You can help with vocabulary, sentence construction and grammer in a natural unstressful way. You will not slow down their ability to write for themselves, either. We have regularly found that children's expectations of themselves as writers improves rapidly as does their confidence in themselves. I recall one eight year old, usually reluctant, writer sitting back, hands folded behind his head, a big smile on his face as he prepared to tell his story. "This is class", he said, sighing with satisfaction, and went on to create a long and interesting narrative. Giving older children (teens included) an opportunity for creative brainstorming. Sometimes in creative writing possible ideas drift around the mind but vanish the moment the pen touches the paper. Taking notes for the person planning a story, or essay can commit those first ideas to paper. These provide notes for the writer to use. Support for planning and structuring stories, essays and projects can also be offered in this way, either in school where the scribe may be teacher or peer, or at home. Giving an overloaded or tired young person a break. Sometimes just acting as a temporary “dictation machine” can change the mental focus on a piece of work and make it seem manageable again. Offering a “scribing” break can create renewed enthusiasm. It also offers opportunity for bouncing ideas around with the scribe and can spark new avenues of thought. Often reading back scribed pieces to the author will enable him or her to reflect on the work and find new direction and possibilities. If teens have experienced scribing when younger, the “scribing break” can be a supportive way of helping students in the home setting.